Ever wonder where monsters go to unwind? You can find the answer in Hotel Transylvania, an animated family film. The secret hotel shows this revealing look at monsters in a way similar to how Monsters Inc. style way. But should you check out of this film? 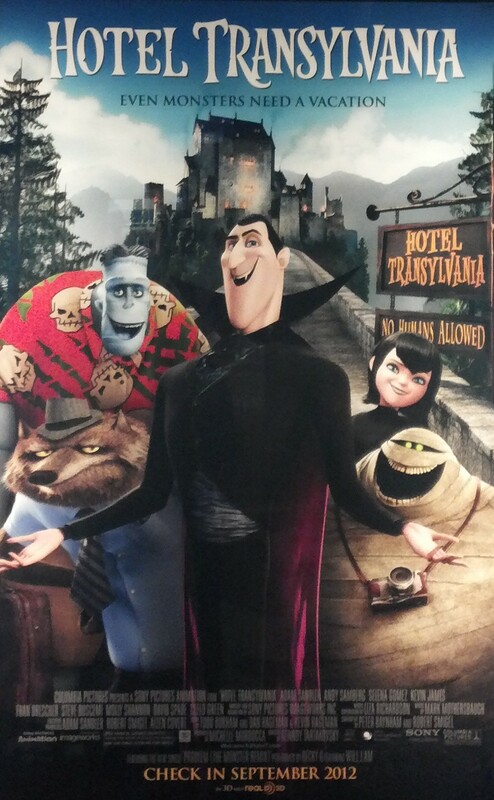 Under the jurisdiction of Count Dracula (Adam Sandler), Hotel Transylvania is a luxury hotel where monsters can relax without worrying about the “dangerous” humans. The hotel is also where the Count along with his daughter Mavis (Selena Gomez) lives; who is approaching her 118th birthday. As her fondest wish is to go out into the world, an overprotective Dracula attempts to discourage his daughter from leaving the hotel while trying to keep his guests happy. Dracula’s task becomes even harder when a human (Andy Samberg) finds the secluded hotel & turns the hotel upside down. The voice acting throughout the movie was good. Adam Sandler’s Dracula was almost unrecognizable at first. I thought that it was him but the questions about the whole movie if that was really Adam Sandler played Dracula. Andy Samberg was cast was perfectly cast as the young kid on wide eyed kid who was open to living among the monsters. Other talent includes Cee Lo Green as the Mummy, Kevin James as Frankenstein and Fran Drescher as the bride of Frankenstein really rounded out a very interesting cast. While they were there were hints of directors Tartakovsky’s earlier work, Dexter’s Laboratory throughout the movie, the story seems too formulaic, predictable and incredibly clichéd. While Dracula’s back story was intriguing & a poignant look at the ugliness of humanity, this is only after trudging through 70% of a movie laden with mostly unfunny jokes, predictable helicopter parenting overtones & parts that are as dead as the zombie bellboys. Although there were a few funny/witty moments in the movie, the jokes were relatively unfunny as they resort to the standard “we’re a kids movie!” fallbacks like, let’s make a fart joke, the occasional gross out, and a couple of awkward adult jokes that kind of just go over the kids heads.